CyanogenMod is one well known and most preferred custom firmware [ROM] available for Android devices. They usually release latest Android AOKP based ROM for few devices which they support officially but other developers port the ROM to the varied range of devices. You can easily find a Cyanogenmod ROM for a budget smartphone like Moto E or Asus Zenphone 4. CyanogenMod is minimal ROM and they are made from Android Open Kang project. As CyanogenMod is a vast project and spread over many devices, the developers introduced a way to theme the system UI easily with pre-cooked themes. You can download themes from Play Store and install it on any device to get a new look and feel. 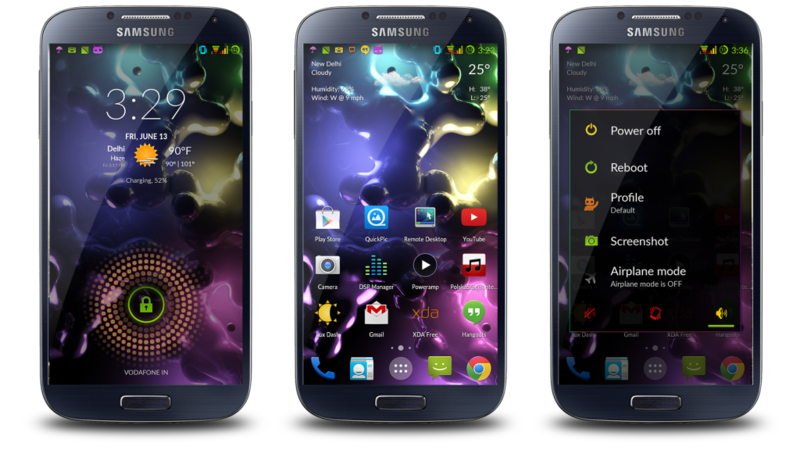 I have recently discovered few new themes for CyanogenMod 12 users. Personally, I am using CyanogenMod on my Galaxy Note N7000. I recently tried Mac theme Gem Flat, It was quite a well-designed theme and love the simple and minimalist approach. It has more than 500 icons inbuilt. There are lots of wallpapers and developer has updated the Google’s Lato Font which makes it much better. You will get a custom ring, notification and alarm tones. Another great theme I tried this week is Roam Plus, developer “thoughtlesskyle” has released a free version as well. But paid version will get you more theming and icons pack. You will really enjoy the look of setting panel, beside that there are lots of minor customizations which you will cherish. 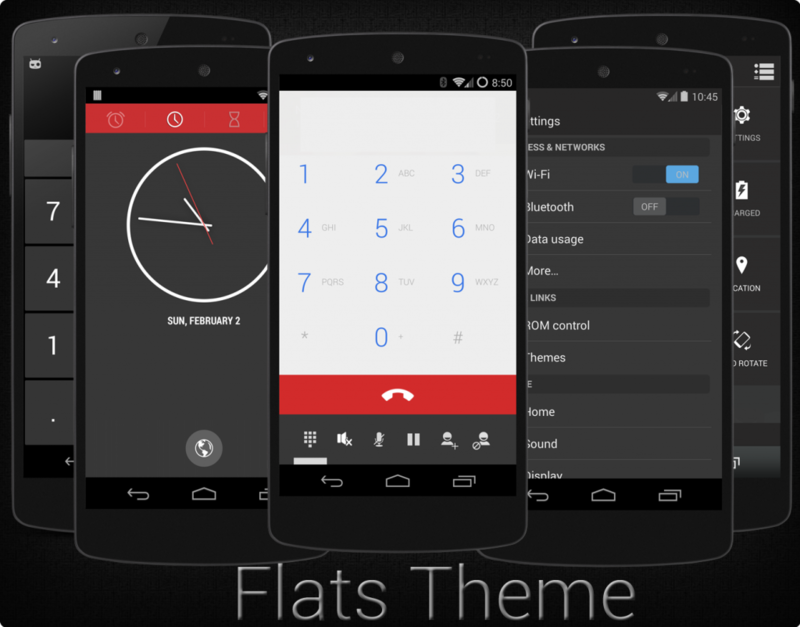 Flats CM12 Theme: CM12 is already minimalistic but Flats theme is rebuilt the whole interface on a Flat and Sleek UI. There are tons of detailing which look great on a full HD screen. You will get custom Bootanimation, wallpaper, lock screen, fonts, sound pack, system style etc. This theme is a paid one and costs $1.49. Dark Material theme for CyanogenMod 12: Some people just love Dark themes, some people say that dark themes save battery as well. This theme is free and offers whole material UI in Dark feel and look. Teal Cm12 theme: This is a free theme as well and offers custom boot animation and almost every element like calculator, dialer, contact etc are customized to match the theme. Piazza Theme CM12: If you are looking for an awesome Paid theme then try Piazza, it just costs $1.49. Works on the latest CyanogenMod Theme Engine, with custom icon Pack. The Look and feel have been kept simple with Material UI. Herathon CyanogenMod 11 Theme: Herathon is a Material UI inspired Theme, there are some deep colors and UI textures that you will love and will provide a refreshing change to your old CyaogenMod ROM look. Herathon provides a complete package of theme elements like systemui, framework, app icons and custom animations. Its free to download and use. Gem flat theme: Gem is a flat UI theme for CyanogenMod and nothing is taken from material design. Its basically a theme for simple black lovers and combines the magic of blue, white and dark grey UI. 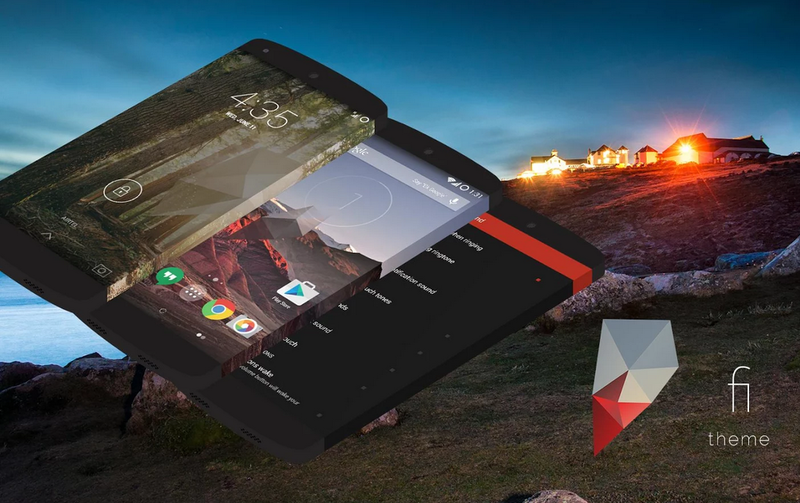 The package includes Android L new Roboto font, custom Icons, in build new Lockscreen and wallpaper. You can also set custom boot animation. 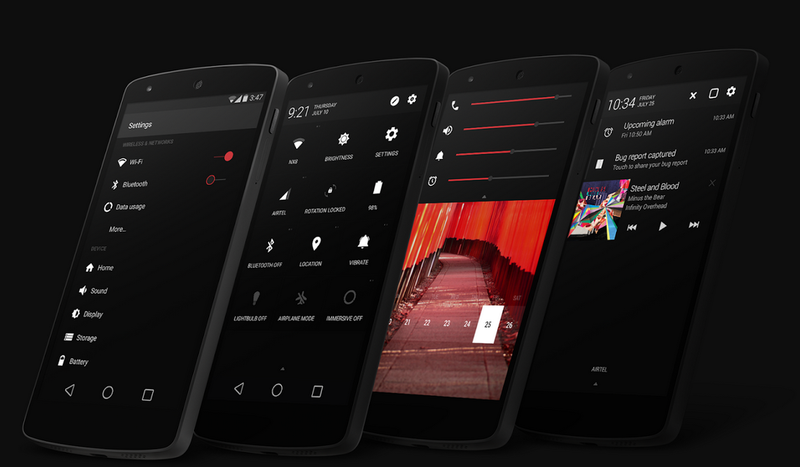 The first contender in our list of top CyanogenMod themes is none other than Veu! Yes Veu is the theme made by Arz Bhatia and surprisingly it stole many hearts! The theme is a perfect example of beauty and perfection mixed together! 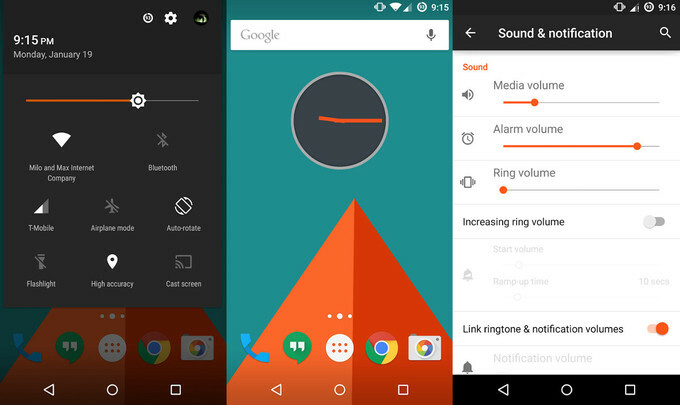 Veu gives you a whole new experience of Android, everything is themed again! Even the tiny dots and separators were themed again to make an awesome experience! It comes with Colour Changing capabilities which you can set with the application provided with it. Currently, there are 3 4 different colours for the themes and they are- Persian Red, Slate Spruce, Torch Pink and Blue Radiance. This means that you would always have the perfect colour to match your mood! Veu introduces you with the complete set of new animated checkboxes and buttons with a clean and pretty design! The theme provides you better text inputs and clarity, Each and everything are redefined and ensures a great and awesome experience with your CM enabled device! The next guy on this list is none other than Fi and again it is developed by the developer of the last theme, I think you might have got an idea and it is none other than Arz Bhatia Once again! According to the developer Fi is the world’s first theme in which user can choose the theme colours! It currently comes with 3 colour options for you to choose from. Fi is actually an abbreviation of Façade Interface and it is a theme with a Flat UI Design. It is made to give you a unique and better user experience. The theme has been designed in such a way that users get refreshed every time they see their device. The main objective of the developer was to change everything that the user looks and this objective led to the birth of a high-quality lock screen which is served with a sweet navigation bar! The main thing in this theme is its main colour which was carroty red in the initial release but keeps on changing every month so as to keep you excited with your phone. The new colour for the theme is released on the 11th of every month but the only thing which you need to do to get the new colour is to update the theme. The next theme which is sitting on our list is Holo Glass theme. I think from the name you may have guessed that what the theme is all about. But sill if you haven’t then let me tell you that this theme is a transparent theme which gives an effect of glass. This means that if you open your app drawer or settings then you can easily see you wallpaper! This theme has 31% transparency and gives a great and clean look to your device! The theme is really refreshing to the eyes and my personal opinion would be that you should go for this theme and set a sunset image or something related to nature as your wallpaper to get an awesome feel! Okay, so this is my personal favourite theme. As the name tells this is based on a flat design and looks great. The theme comes with the red and blue colour with grey as secondary colour! Every thing from the settings menu to the clock widget has been redesigned. The dialler has a new and a better look with clean buttons which are placed at an appropriate distance and carry the perfect size for everyone’s fingers. This theme is based on the stock theme but still looks awesome. Even the status bar is stock and changes as per the colour of the theme you choose! Another awesome and cool feature of this theme is that it even supports tablets! Yes, you heard that right, there are fewer themes which give support for the tablets. Luckily this theme is one of them and yeah I forgot to tell you that you can download this theme for free which means so many advantages in a single theme and that too for free! This is the last theme in our list. Neon colours theme includes a variety of colours. From notifications to app icons everything is having a different colour. This theme is full of colours and makes sure that every time you see the screen you get to see a new colour! This theme is best for the people who love colours and I think most of the people love colours that mean that everyone will love this theme! And the good news is that you don’t need to pay for this theme, you can download it easily from XDA! We will keep updating this page with all awesome theme we find for the CyanogenMod theme. Once you install any of above theme, please do comment below about your experience. You would also love installing some icon packs for Android.